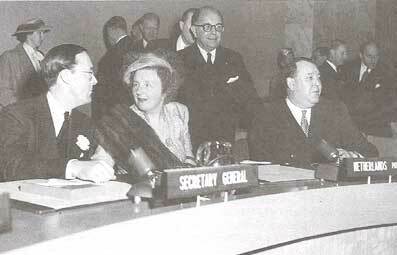 Speeches by Her Majesty Queen Juliana of the Netherlands, and Professor A. S. Bokhari, President of UN Security Council. My husband and I are very happy to have you with us tonight, because, in you we greet the United Nations, and we welcome, in your persons, humanity's magnanimous and desperate try for peace and security. Your task is one of vital importance to the peace of the world, immensely difficult though it may be. As we live in a time which is so full of serious misunderstanding and disagreements, we have every reason to be grateful for the existence in our troubled age of an international body for the safeguarding of security. In the short but most eventful history of this Council the Netherlands have crossed your path. We were not always in full agreement about ways and means, but we did not disagree with you in our common objective to establish conditions of peace, justice and freedom. In principle, in our country, nobody begrudges anybody else his freedom and independence. Wherever the English language is spoken many pleasant references to sport and play are used: They point in a rather casual way to a number of vitally important rules of human conduct. Such standing expressions as "fair play", "team spirit" and "good sport" cannot be translated into any other language, but they are clear to everybody. They do not appear in the Charter of the United Nations but they are nevertheless fundamental. It is sometimes part of your assignment only to play for time in order to let strong feelings cool down and passions abate. I feel, however, that it is your most important task to play for safety, to practice the virtue of prudence, as you have to safeguard international order on earth -in short the "maintenance of peace and security". May your Council be able to live up to its high duties, teaching the , peoples -in the words of the Charter - how "to practice tolerance and live together in peace with one another as good neighbours". The maintenance of peace and security entails consideration for existing law and order, loving care for established institutions and respect for those relations in human society which have proved their value. On the other hand it sometimes happens that new life is growing behind the old order, new faces look around the corner, new states ask to be seated at our table, claiming full respect for their rights and their new dignity. The occasion was a formal dinner hosted by Queen Juliana in the Grand Ballroom of New York's Colony Club, April 8, 1952. Time and again the old and well-tried makes room for the new and unknown. Some will praise the old, feeling that there are many reasons to be proud of it. Others will welcome the new, in the firm belief that the old order is no longer identical with justice. In the United Nations the old and the new, the rule of established law and the process of evolution, are both asserting themselves. The Security Council will need a great deal of prudence while considering both the old and the new, in discerning what has value and what has not, especially in a time when propaganda is mixing up the facts, and falsifying the issues the daylight may not see or the Security Council either! Luckily your eyes are sharper than some people hope! In these days the fear of a new war overshadows everything in the hearts and minds of mankind. Why is humanity in the grip of such great.fear? Is it that the natural principle of life, of man being the master of his instruments, his tools, his weapons, now stands in danger of being reversed: the instrument becoming the master of man, the threatening robot, the monster that we made ourselves? Aggression is his name! One of the methods by which we are trying to save the human race is the United Nations and its Security Council. When a fire threatens somewhere in the world they must prevent it and when it does break out they have to extinguish it as speedily as possible. The important thing is that the United Nations is growing more resolute in its attitude toward aggression. This strengthens confidence in the United Nations. The League of Nations has succumbed from weakness. But the real r,eadiness nowadays to take action for a purpose which is in line with the United Nations idea, whatever the stakes: this is what counts and gives confidence also for the future. To save the human race - this is the vital urge to preserve the species, it is the vital urge to have as much out of life as we can; or, I wish we all would put it: to make as much out of life as we can. And certainly we have a right to this. After all, life has been granted to man! Aggression means presenting death to another, as a requirement for claiming life for oneself! For when we commit aggression we turn a handle which makes the monster start to move, causing irrevocable chaos and destruction. Then it will throw this in our faces as a fact. Once faced by this fatal fact, the only way we have to save the world is to make life safe for man, and in the end the weapons for war and death will rust away by them.selves. In the course of these years in which we live, either we go to perdition, or we come to peace. It is not to paradise we then will come but at least to peace. I believe that there is indeed a great mission for you to fulfil by your striving for security for the community of nations, for all these people, whether represented in the United Nations or not yet. want it for themselves, but they would alsp wholeheartedly wish it for anybody else. We all agreed that we all want these things for everyone! there still is life, there still is hope. 0 God, Thou ever wert. 0 leave me not ungirt. This is a rare and memorable occasion. It is a rare privilege for the Security Council to receive hospitality at a sovereign's table. That Your Majesty should have commanded us to be your guest when yourself a guest in this country, is a gesture of particular graciousness of which we are fully sensible. May I on behalf of myself and my colleagues on the Security Council respectfully offer our deepest gratitude for the great honour that Your Majesty has bestowed upon us. voJ evening's brilliant function. The address which we have been privileged to hear from your Majesty's own lips this evening will ever be a source of inspiration to us. Your Majesty's wise observations on the process of evolution in human affairs, which should be so guided as to create the most by destroying the least, are needed by all of us in the world today in order to check us when we are imprudent and impetuous and to stir us when we are sluggish and indifferent. I assure Your Majesty that your great understanding of our difficulties will be highly appreciated and your staunch faith in our mission and belief in the virtQes of tolerance and good neighbourliness, will be echoed and applauded in far wider circles than that of Your Majesty's guests this evening. The "two billion ordinary, normal people" whom Your Majesty has so feelingly mentioned in democratic human terms sorely need every hope that can be held out to them. Coming from Your Majesty, such hopeful words have great power and significance, coupled as they were by Your Majesty's reference to your great and noble ancestor, founder of the independence of the Dutch nation and of the illustrious dynasty which for so many centuries has guided that nation's destinies. William the Silent, whose ideals were in many respects far in advance of the age in which he lived, will always be acclaimed as one of the first European champions of tolerance and religious, political and personal freedoms. As such, he belongs not merely to your great country and noble ancestry but to th~ whole of mankind. For the influence of his thoughts, words and deeds has transcended the boundaries of his country for which he struggled and gave his life. The principles for which he stood are the very principles on which the United Nations has been built. Very justly, Your Majesty has referred to the part that the Netherlands has played in striving towards our common goal of peace, justice and freedom. The location of the International Court of Justice at The Hague is nothing less than the acknowledgement by the whole world of the valuable contributions that Your Majesty's distinguished countrymen have made to international law. The high traditions of respect for international law and justice which they have built up have been nobly maintained by the representatives of The Netherlands in the United Nations as well as in other. international forums. Nor can the international community fail to recognize with deep appreciation the fact that Your Majesty's own palace at The Hague has now been placed at the disposal of The Netherlands Institute of Social Studies for the benefit of scholars from allover the world. Above all, it is with Your Majesty's reign that an event of the greatest import in modern times will be associated, whose happy conclusion brought freedom to a great Asian people. Differences of opinion may indeed sometimes arise about the means and methods by which the freedoms of nations and peoples may be finally achieved, but even these differences become a source of ultimate strength in a democratic world as long as we remain in agreement on the fundamental principles and purposes of the Charter of the United Nations. In our organization, The Netherlands representatives have played and are playing a part worthy of the homeland of Grotius. Our friend and colleague, His Excellency Ambassador D. J. von Balluseck, by his dignity, wisdom and high level of responsibility, his able deputy Dr. J. M. A. H. Luns, by his ability and great sense of duty, and both of them and their .icompanions in life, Madame Balluseck and Madame Luns, by their unas- 4 suming charm and unfailing courtesy, won our respect and esteem and' have endeared Your Majesty's country to us. Once more I thank Your Majesty for your hospitality and for your inspiring words. It is no mere coincidence that the expression of such devotion to the lofty principles of the United Nations and of concern for the welfare of the people of the world come from a Queen who combines the exalted position of a Ruler with the noble and tender duties of a mother. Your Majesty knows what other mothers feel and what other children need. The world would be a much happier place if all leaders of the people could follow Your Majesty's humane example. While expressing the fervent hope that our effort may be of service to mankind and fulfill the expectations that Your Majesty has voiced this evening, I raise my glass to salute Your Majesty and Your Royal Highness to wish you both the greatest happiness in your country and to your country and your people, peace, prosperity and forever a distinguished place in the history of human progress.